Before you begin, make sure to thoroughly clean your sensory deprivation study pod. As you prepare to review test material, forming a study group is a great way to enlist the help of other students just as hopelessly lost as you are. Mnemonic devices are proven to be great study aids. Create memorable little rhymes to help retain pertinent information without the burden of context. Drop in on your professor’s office hours to remind them the student union is named after your mother. Prepare yourself for likely answers by writing “A,” “B,” “C,” and “D” on flash cards. Design as realistic a workload for yourself as possible. Map out a study week plan to more effectively manage your nervous breakdown. Always select the energy drink can with the most flames. Visualization is a great way to remember key concepts, so try picturing how fucked you’re going to be if you forget how the Hegelian dialectic works. Highlight every line of text. 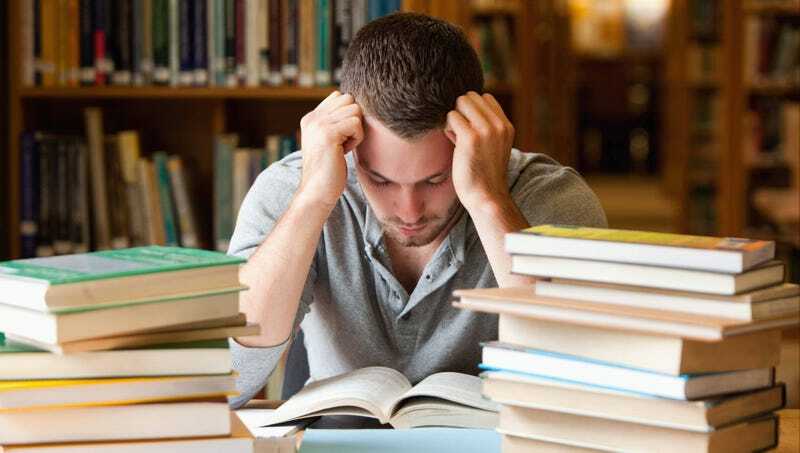 Education experts agree that cramming the night before a big test is substantially less effective than gradually absorbing the necessary knowledge in the weeks and months leading up to the exam. Hopefully that helps. Just do your best, and remember that you’ve had more opportunities, privilege, and support than anyone in your family’s history.